Canadian National (CN; French: Canadien National ) is a Canadian Class I freight railway headquartered in Montreal, Quebec that serves Canada and the Midwestern and Southern United States. CN is Canada's largest railway, in terms of both revenue and the physical size of its rail network, and is Canada's only transcontinental railway company, spanning Canada from the Atlantic coast in Nova Scotia to the Pacific coast in British Columbia across about 20,400 route miles (32,831 km) of track. CN is a public company with 24,000 employees and as of September 2018 it had a market cap of approximately $84 billion Canadian dollars. CN was government-owned, having been a Canadian Crown corporation from its founding to its privatization in 1995. In 2011, Bill Gates was the largest single shareholder of CN stock. The railway was referred to as the "Canadian National Railways" (CNR) between 1918 and 1960, and as "Canadian National"/"Canadien National" (CN) from 1960 to the present. The Canadian National Railways (CNR) was incorporated on June 6, 1919, comprising several railways that had become bankrupt and fallen into federal government hands, along with some railways already owned by the government. On November 17, 1995, the federal government privatized CN. Over the next decade, the company expanded significantly into the United States, purchasing Illinois Central Railroad and Wisconsin Central Transportation, among others. Now primarily a freight railway, CN also operated passenger services until 1978, when they were assumed by Via Rail. The only passenger services run by CN after 1978 were several mixed trains (freight and passenger) in Newfoundland, and a several commuter trains both on CN's electrified routes and towards the South Shore in the Montreal area (the latter lasted without any public subsidy until 1986). The Newfoundland mixed trains lasted until 1988, while the Montreal commuter trains are now operated by Montreal's AMT. In response to public concerns fearing loss of key transportation links, the government of Canada assumed majority ownership of the near bankrupt Canadian Northern Railway (CNoR) on September 6, 1918, and appointed a "Board of Management" to oversee the company. At the same time, CNoR was also directed to assume management of Canadian Government Railways (CGR), a system comprising the Intercolonial Railway of Canada (IRC), National Transcontinental Railway (NTR), and the Prince Edward Island Railway (PEIR), among others. On December 20, 1918, the federal government created the Canadian National Railways (CNR) – a title only with no corporate powers – through a Canadian Privy Council Order in Council as a means to simplify the funding and operation of the various railway companies. The absorption of the Intercolonial Railway would see CNR adopt that system's slogan The People's Railway. Another Canadian railway, the Grand Trunk Pacific Railway (GTPR), encountered financial difficulty on March 7, 1919, when its parent company Grand Trunk Railway (GTR) defaulted on repayment of construction loans to the federal government. The federal government's Department of Railways and Canals took over operation of the GTPR until July 12, 1920, when it too was placed under the CNR. The Canadian National Railway was organized on October 10, 1922. Finally, the bankrupt GTR itself was placed under the care of a federal government "Board of Management" on May 21, 1920, while GTR management and shareholders opposed to nationalization took legal action. After several years of arbitration, the GTR was absorbed into CNR on January 30, 1923. In subsequent years, several smaller independent railways would be added to the CNR as they went bankrupt, or it became politically expedient to do so, however the system was more or less finalized following the addition of the GTR. Canadian National Railways was born out of both wartime and domestic urgency. Railways, until the rise of the personal automobile and creation of taxpayer-funded all-weather highways, were the only viable long-distance land transportation available in Canada for many years. As such, their operation consumed a great deal of public and political attention. Many countries regard railway networks as critical infrastructure (even to this day) and at the time of the creation of CNR during the continuing threat of the First World War, Canada was not the only country to engage in railway nationalization. In the early 20th century, many governments were taking a more interventionist role in the economy, foreshadowing the influence of economists like John Maynard Keynes. This political trend, combined with broader geo-political events, made nationalization an appealing choice for Canada. The Winnipeg General Strike of 1919 and allied involvement in the Russian Revolution seemed to validate the continuing process. The need for a viable rail system was paramount in a time of civil unrest and foreign military intervention. CN Telegraph originated as the Great North West Telegraph Company in 1880 to connect Ontario and Manitoba and became a subsidiary of Western Union in 1881. In 1915, facing bankruptcy, GNWTC was acquired by the Canadian Northern Railway's telegraph company. When Canadian Northern was nationalized in 1918 and amalgamated into Canadian National Railways in 1921, its telegraph arm was renamed the Canadian National Telegraph Company. CN Telegraphs began co-operating with its Canadian Pacific owned rival CPR Telegraphs in the 1930s, sharing telegraph networks and co-founding a teleprinter system in 1957. In 1967 the two services were amalgamated into a joint venture CNCP Telecommunications which evolved into a telecoms company. CN sold its stake of the company to CP in 1984. In 1923 CNR's second president, Sir Henry Thornton who succeeded David Blyth Hanna (1919–1922), created the CNR Radio Department to provide passengers with entertainment radio reception and give the railway a competitive advantage over its rival, CP. This led to the creation of a network of CNR radio stations across the country, North America's first radio network. As anyone in the vicinity of a station could hear its broadcasts the network's audience extended far beyond train passengers to the public at large. Claims of unfair competition from CP as well as pressure on the government to create a public broadcasting system similar to the British Broadcasting Corporation led the government of R.B. Bennett (who had been a corporate lawyer with Canadian Pacific as a client prior to entering politics) to pressure CNR into ending its on-train radio service in 1931 and then withdrawing from the radio business entirely in 1933. CNR's radio assets were sold for $50,000 to a new public broadcaster, the Canadian Radio Broadcasting Commission, which in turn became the Canadian Broadcasting Corporation in 1936. 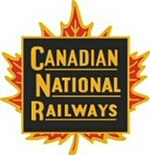 An early logo or "herald" of the Canadian National Railways. 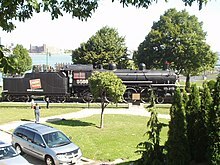 It was replaced by the CN "worm" in 1960. Canadian railways built and operated their own resort hotels, ostensibly to provide rail passengers travelling long distances a place to sleep overnight. These hotels became attractions in and of themselves – a place for a rail passenger to go for a holiday. As each railway company sought to be more attractive than its competitors, they made their hotels more attractive and luxurious. Canadian National Hotels was the CNRs chain of hotels and was a combination of hotels inherited by the CNR when it acquired various railways and structures built by the CNR itself. The chain's principal rival was Canadian Pacific Hotels. Canadian National operated a fleet of passenger and cargo vessels on both the West Coast and East Coast of Canada which operated under a branch of the company known as Canadian National Steamships, later CN Marine. Swan Hunter and Wigham Richardson of Wallsend, England, built Prince George and Prince Rupert for the Grand Trunk Pacific Railway in 1910. In 1930 Cammell Laird of Birkenhead, England, built Prince David, Prince Henry and Prince Robert. Prince Henry was sold in 1937. Prince George was destroyed by fire in 1945. Prince David and Prince Robert were requisitioned in 1939 as Royal Canadian Navy armed merchant cruisers, converted into landing ships in 1943, and sold in 1948. In 1948 a second Prince George was built by Yarrows Limited, becoming CN's sole remaining Pacific Coast passenger liner. She was switched from scheduled routes to pleasure cruises, and was the last CN ship that served the west coast. After a fire in 1975 she was sold in 1976 (first to British Columbia Steamship Company and finally Wong Brother Enterprises) before finally being sold to Chinese breakers in 1995 (and sank on her way to China in 1996 in Unimak Pass). CN Canora was built in 1918 for the Canadian Northern Pacific's Patricia Bay to Port Mann route. In 1919 the ship became part of Canadian National. Prince George (1910–45) – Caught fire and destroyed in 1945. Ships specially built for CN for the West Coast. After the Second World War steamship service had dropped and by the 1950s the ships were withdrawn. Prince George (II) stayed in service, but to do cruises on the West Coast. By 1975 Prince George (II) was retired, ending CN's steamship era on the West Coast. Prince George (II) (1948–1975) – Built and replaced the first Prince George after it caught fire in 1945. Prince George (II) was the last ship that served the west coast for CN. In 1928–29 Cammell Laird built a set of five ships for CN to carry mail, passengers and freight between eastern Canada and the Caribbean via Bermuda. Each ship was named after the wife of an English or British admiral who was noted for his actions in the Caribbean, and who had been knighted or ennobled. They were therefore nicknamed the Lady-liners or Lady-boats. Lady Nelson along with Lady Hawkins and Lady Drake were designed for service to eastern islands of the British West Indies and had larger passenger capacity but lesser cargo capacity than Lady Rodney and Lady Somers who were built for service to western islands. In the Second World War Lady Somers was requisitioned as an ocean boarding vessel; an Italian submarine sank her in 1941. Her four sister ships continued in CN service, but Lady Hawkins and Lady Drake were sunk by German submarines in 1942. Lady Nelson was torpedoed in 1942 but refloated and converted to a hospital ship while Lady Rodney survived the war unscathed. The two surviving Lady Boats were sold in 1952 after declining passenger traffic and rising labour costs made them too expensive to run. In 1928 CN took over most of the fleet of Canadian Government Merchant Marine Ltd, giving it a fleet of about 45 cargo ships. When France surrendered to Germany in June 1940 the Canadian Government seized CGT's MV Maurienne and contracted CN to manage her. Regardless of the political and economic importance of railway transportation in Canada, there were many critics of the Canadian government's policies in maintaining CNR as a Crown corporation from its inception in 1918 until its privatization in 1995. Some of the most scathing criticism came from the railway industry itself—namely the commercially successful Canadian Pacific Railway (CPR), which argued its taxes should not be used to fund a competitor. As a result of history and geography, the CPR served larger population centres in the southern Prairies, while the CNR's merged system served as a de facto government colonization railway to serve remote and underdeveloped regions of Western Canada, northern Ontario and Quebec, and the Maritimes. CN was also disadvantaged by being formed from a collection of insolvent rail systems that were not intrinsically viable, as they seldom had the shortest route between any major cities or industrial centres; to this day,[when?] CN has many division points far from significant industries or traffic sources. The only notable exception is the former Grand Trunk mainline between Montreal and Chicago. The company was also used as an instrument of federal government policy, from the operation of ferries in Atlantic Canada, to assuming the operation of the narrow-gauge Newfoundland Railway following that province's entry into Confederation, and the partnership with CPR in purchasing and operating the Northern Alberta Railways. CNR was considered competitive with CPR in several areas, notably in Central Canada, prior to the age of the automobile and the dense highway network that grew in Ontario and Quebec. The former GTR's superior track network in the Montreal–Chicago corridor has always been a more direct route with higher capacity than CPR's. CNR was also considered a railway industry leader throughout its time as a Crown corporation in terms of research and development into railway safety systems, logistics management, and in terms of its relationship with labour unions. From the creation of CNR in 1918 until its recapitalization in 1978, whenever the company posted a deficit, the federal government would assume those costs in the government budget. The result of various governments using CNR as a vehicle for various social and economic policies was a subsidization running into billions of dollars over successive decades. Following its 1978 recapitalization and changes in management, CN (name changed to Canadian National Railway, using the shortened acronym CN in 1960) started to operate much more efficiently, by assuming its own debt, improving accounting practices to allow depreciation of assets and to access financial markets for further capital. Now operating as a for-profit Crown corporation, CN reported a profit in 11 of the 15 years from 1978 to 1992, paying $371 million in cash dividends (profit) to the federal government in this time. 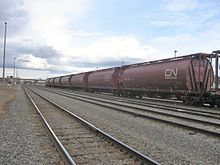 CN's rise to profitability was assisted when the company started to remove itself from non-core freight rail transportation starting in 1977 when subsidiary Air Canada (created in 1937 as Trans-Canada Air Lines) became a separate federal Crown corporation. That same year saw CN move its ferry operations into a separate Crown corporation named CN Marine, followed similarly by the grouping of passenger rail services (for marketing purposes) under the name Via-CN. The following year (1978), the federal government decided to create Via Rail as a separate Crown corporation to take over passenger services previously offered by both CN and CPR, including CN's flagship transcontinental train the Super Continental and its eastern counterpart the Ocean. CN Marine was renamed Marine Atlantic in 1986 to remove any references to its former parent organization. CN also grouped its money-losing Newfoundland operations into a separate subsidiary called Terra Transport so federal subsidies for this service would be more visible in company statements. CN also divested itself in the late 1970s and throughout the 1980s of several non-rail transportation activities such as trucking subsidiaries, a hotel chain (sold to CPR), real estate, and telecommunications companies. The biggest telecommunications property was a company co-owned by CN and CP (CNCP Telecommunications) that originated from a joint venture involving the railways' respective telegraph services. On its sale in the 1980s, it was successively renamed Unitel (United Telecommunications), AT&T Canada, and Allstream as it went through various owners and branding agreements. CN sold Terra Nova Tel to Newfoundland Telephone in 1988. Another telecommunications property wholly owned and built by CN was the CN Tower in Toronto, which still keeps its original name but was divested by the railway company in the mid-1990s. All proceeds from such sales were used to pay down CN's accumulated debt. At the time of their divestitures, all of these subsidiaries required considerable subsidies, which partly explained CN's financial problems prior to recapitalization. CN also was given free rein by the federal government following deregulation of the railway industry in the 1970s, as well as in 1987, when railway companies began to make tough business decisions by removing themselves from operating money-losing branch lines. In CN's case, some of these branch lines were those it had been forced to absorb through federal government policies and outright patronage, while others were from the heady expansion era of rural branch lines in the 1920s and early 1930s and were considered obsolete following the development of local road networks. In the period starting in the late 1970s and throughout the 1980s and early 1990s, thousands of kilometres of railway lines were abandoned, including the complete track networks on Newfoundland (CN subsidiary Terra Transport, the former Newfoundland Railway ended railway freight operations and mixed freight-passenger trains in 1988. Mainline Passenger rail service in Newfoundland ended in 1969.) and Prince Edward Island (the former PEIR), as well as numerous branch lines in Nova Scotia, New Brunswick, Southern Ontario, throughout the Prairie provinces, in the British Columbia interior, and on Vancouver Island. Virtually every rural area served by CN in some form was affected, creating resentment for the company and the federal government. Many of these now-abandoned rights-of-way were divested by CN and the federal government and have since been converted into recreational trails by local municipalities and provincial governments. CN's railway network in the late 1980s consisted of the company's Canadian trackage, along with the following U.S. subsidiary lines: Grand Trunk Western Railroad (GTW) operating in Michigan, Indiana, and Illinois; Duluth, Winnipeg and Pacific Railway (DWP) operating in Minnesota; Central Vermont Railway (CV) operating down the Connecticut River valley from Quebec to Long Island Sound; and a former GT line to Portland, Maine, known informally as the Grand Trunk Eastern, sold to a short-line operator in 1989. The headquarters of CN in Downtown Montreal. In 1992, a new management team led by ex-federal government bureaucrats, Paul Tellier and Michael Sabia, started preparing CN for privatization by emphasizing increased productivity. This was achieved largely through aggressive cuts to the company's bloated and inefficient management structure, widescale layoffs in its workforce and continued abandonment or sale of its branch lines. In 1993 and 1994, the company experimented with a rebranding that saw the names CN, Grand Trunk Western, and Duluth, Winnipeg, and Pacific replaced under a collective CN North America moniker. In this time, CPR and CN entered into negotiations regarding a possible merger of the two companies. This was later rejected by the federal government, whereupon CPR offered to purchase outright all of CN's lines from Ontario to Nova Scotia, while an unidentified U.S. railroad (rumoured to have been Burlington Northern Railroad) would purchase CN's lines in western Canada. This too was rejected. In 1995, the entire company including its U.S. subsidiaries reverted to using CN exclusively. The CN Commercialization Act was enacted into law on July 13, 1995, and by November 28, 1995, the federal government had completed an initial public offering (IPO) and transferred all of its shares to private investors. Two key prohibitions in this legislation include, 1) that no individual or corporate shareholder may own more than 15% of CN, and 2) that the company's headquarters must remain in Montreal, thus maintaining CN as a Canadian corporation. Following the successful IPO, CN has recorded impressive gains in its stock price, largely through an aggressive network rationalization and purchase of newer more fuel-efficient locomotives. Numerous branch lines were shed in the late 1990s across Canada, resulting in dozens of independent short line railway companies being established to operate former CN track that had been considered marginal. This network rationalization resulted in a core east-west freight railway stretching from Halifax to Chicago and Toronto to Vancouver and Prince Rupert. The railway also operated trains from Winnipeg to Chicago using trackage rights for part of the route south of Duluth. In addition to the rationalization in Canada, the company also expanded in a strategic north-south direction in the central United States. In 1998, in an era of mergers in the US railway industry, CN bought the Illinois Central Railroad (IC), which connected the already existing lines from Vancouver, British Columbia to Halifax, Nova Scotia with a line running from Chicago, Illinois to New Orleans, Louisiana. This single purchase of IC transformed CN's entire corporate focus from being an east-west uniting presence within Canada (sometimes to the detriment of logical business models) into a north-south NAFTA railway (in reference to the North American Free Trade Agreement). CN is now feeding Canadian raw material exports into the U.S. heartland and beyond to Mexico through a strategic alliance with Kansas City Southern Railway (KCS). Properties of the Canadian National Railway in the United States serve in many instances as routes for Amtrak. Pictured is the Amtrak station in Hammond, Louisiana, refurbished with a modern passenger platform. This segment of the Canadian National Railway was built in 1854 to form part of the New Orleans, Jackson and Great Northern railway, which later became part of Illinois Central. In 1999, CN and BNSF Railway, the second largest rail system in the U.S., announced their intent to merge, forming a new corporate entity North American Railways, headquartered in Montreal to conform to the CN Commercialization Act of 1995. The merger announcement by CN's Paul Tellier and BNSF's Robert Krebs was greeted with skepticism by the U.S. government's Surface Transportation Board (STB), and protested by other major North American rail companies, namely Canadian Pacific Railway (CPR) and Union Pacific Railroad (UP). Rail customers[who?] also denounced the proposed merger, following the confusion and poor service sustained in southeastern Texas in 1998 following UP's purchase of Southern Pacific Railroad two years earlier. In response to the rail industry, shippers, and political pressure, the STB placed a 15-month moratorium on all rail industry mergers, effectively scuttling CN-BNSF plans. Both companies dropped their merger applications and have never refiled. After the STB moratorium expired, CN purchased Wisconsin Central (WC) in 2001, which allowed the company's rail network to encircle Lake Michigan and Lake Superior, permitting more efficient connections from Chicago to western Canada. The deal also included Canadian WC subsidiary Algoma Central Railway (ACR), giving access to Sault Ste. Marie and Michigan's Upper Peninsula. The purchase of Wisconsin Central also made CN the owner of EWS, the principal freight train operator in the United Kingdom. On May 13, 2003, the provincial government of British Columbia announced the provincial Crown corporation, BC Rail (BCR), would be sold with the winning bidder receiving BCR's surface operating assets (locomotives, cars, and service facilities). The provincial government is retaining ownership of the tracks and right-of-way. On November 25, 2003, it was announced CN's bid of $1 billion CAD would be accepted over those of CPR and several U.S. companies. The transaction was closed effective July 15, 2004. Many opponents – including CPR – accused the government and CN of rigging the bidding process, though this has been denied by the government. Documents relating to the case are under court seal, as they are connected to a parallel marijuana grow-op investigation connected with two senior government aides also involved in the sale of BC Rail. Also contested was the economic stimulus package the government gave cities along the BC Rail route. Some saw it as a buy-off to get the municipalities to cooperate with the lease, though the government asserted the package was intended to promote economic development along the corridor. Passenger service along the route had been ended by BC Rail a few years earlier due to ongoing losses resulting from deteriorating service. The cancelled passenger service has subsequently been replaced by a blue-plate tourist service, the Rocky Mountaineer, with fares well over double what the BCR coach fares had been. CN also announced in October 2003 an agreement to purchase Great Lakes Transportation (GLT), a holding company owned by Blackstone Group for $380 million USD. GLT was the owner of Bessemer & Lake Erie Railroad, Duluth, Missabe and Iron Range Railway, and the Pittsburgh & Conneaut Dock Company. The key instigator for the deal was the fact that since the Wisconsin Central purchase, CN was required to use Duluth, Missabe and Iron Range Railway trackage rights for a short 11 mi (18 km) "gap" near Duluth, Minnesota on the route between Chicago and Winnipeg. To purchase this short section, CN was told by GLT it would have to purchase the entire company. Also included in GLT's portfolio were 8 Great Lakes vessels for transporting bulk commodities such as coal and iron ore as well as various port facilities. Following Surface Transportation Board approval for the transaction, CN completed the purchase of GLT on May 10, 2004. On December 24, 2008, the STB approved CN's purchase for $300 million of the principal lines of the Elgin, Joliet & Eastern Railway Company (EJ&E) (reporting mark EJE) from US Steel Corp originally announced on September 27, 2007. The STB's decision was to become effective on January 23, 2009, with a closure of the transaction shortly thereafter. The EJ&E lines create a bypass around the western side of heavily congested Chicago-area rail hub and its conversion to use for mainline freight traffic is expected to alleviate substantial bottlenecks for both regional and intercontinental rail traffic subject to lengthy delays entering and exiting Chicago freight yards. The purchase of the lightly used EJ&E corridor was positioned by CN as a boon not only for its own business but for the efficiency of the entire US rail system. On December 31, 2011, CN completed the merger of Duluth, Missabe and Iron Range Railway Company; Duluth, Winnipeg and Pacific Railway Company; and Wisconsin Central Ltd. into its Wisconsin Central Ltd. subsidiary. Since the company operates in two countries, CN maintains some corporate distinction by having its U.S. lines incorporated under the Grand Trunk Corporation for legal purposes;, however, the entire company in both Canada and the U.S. operates under CN, as can be seen in its locomotive and rail car repainting programs. Since the Illinois Central purchase in 1998 CN has been increasingly focused on running a "scheduled freight railroad/railway." This has resulted in improved shipper relations, as well as reduced the need for maintaining pools of surplus locomotives and freight cars. CN has also undertaken a rationalization of its existing track network by removing double track sections in some areas and extending passing sidings in other areas. CN is also a rail industry leader in the employment of radio-control (R/C) for switching locomotives in yards, resulting in reductions to the number of yard workers required. CN has frequently been touted in recent years within North American rail industry circles as being the most-improved railroad in terms of productivity and the lowering of its operating ratio, acknowledging the fact the company is becoming increasingly profitable. Due to the rising popularity of ethanol, shuttle trains, and mineral commodities, CN Rail Service is increasing in popularity. In April 2012 a plan was announced to build an 800 kilometres (500 mi) railway that would run north from Sept-Îles, Quebec; the railway would support mining and other resource extraction in the Labrador Trough. In September 2012, CN announced the trial of locomotives fuelled by natural gas as a potential alternative to conventional diesel fuel. Two SD-40 diesel-electric locomotives fuelled with 90% natural gas and 10% diesel are in service between Edmonton and Fort McMurray, Alberta. In December 1999 the Ultratrain, a petroleum products unit train linking the Levis (Quebec) Ultramar oil refinery with a petroleum depot in Montreal, exploded when it collided with a derailed freight train travelling in the opposite direction between Sainte-Madeleine and Saint-Hilaire-Est, south of Montreal, killing the crew of the freight train (the Ultratrain crew's last words were "you guys are derailed, we're hitting you!"). The other train derailed at a broken rail caused by a defective weld that was not fixed in time, despite being repeatedly reported by train crews; the report by the Transportation Safety Board of Canada called into question CN's quality assurance program for rail welds as well as the lack of detection equipment for defective wheels. In memory of the dead crewmen, two new stations on the line have been named after them (Davis and Thériault). On May 27, 2002, a CN train derailed at 12:30 p.m. north of Vermontville Highway in Potterville, Michigan. The train was hauling a total of 58 cars. Thirty-five of the cars derailed and 11 of them contained hazmat material. Nine were carrying propane and two cars carried sulfuric acid. Two of the propane tankers were leaking and a third was suspected of leaking. Each propane car contains 34,000 gallons of propane gas which is considered an extreme fire and explosive hazard. An evacuation of Potterville was declared. CN along with other agencies worked throughout the week to clean the area. A second CN train derailment in Potterville, Michigan, occurred in May 2006, though no evacuation was necessary. The cause of this derailment was found to be a failed wheel bearing on the 82nd car. About 9:04 am central standard time on February 9, 2003, northbound CN freight train M33371 derailed 22 of its 108 cars in Tamaroa, Illinois. Four of the derailed cars released methanol, and the methanol from two of these four cars fueled a fire. Other derailed cars contained phosphoric acid, hydrochloric acid, formaldehyde, and vinyl chloride. Two cars containing hydrochloric acid, one car containing formaldehyde, and one car containing vinyl chloride released product but were not involved in the fire. About 850 residents were evacuated from the area within a 3-mile (4.8 km) radius of the derailment, which included the entire village of Tamaroa. Improper placement of bond wire welds on the head of the rail just outside the joint bars, where untempered martensite associated with the welds led to fatigue and subsequent cracking that, because of increased stresses associated with known soft ballast conditions, rapidly progressed to rail failure. On May 14, 2003, a trestle collapsed under the weight of a freight train near McBride, B.C., killing both crew members. Both men had been disciplined earlier for refusing to take another train on the same bridge, claiming it was unsafe. It was revealed that as far back as 1999, several bridge components had been reported as rotten, yet no repairs had been ordered by management. Eventually, the disciplinary records of both crewmen were amended posthumously. Controversy arose again in Canadian political circles in 2003 following the company's decision to refer solely to its acronym "CN" and not "Canadian National", a move some interpret as being an attempt to distance the company from references to "Canada". Canada's Minister of Transport at the time called this policy move "obscene" after nationalists noted it could be argued the company is no longer Canadian, being primarily owned by American stockholders. The controversy is somewhat tempered by the fact a majority of large corporations are being increasingly referred to by acronyms. In March 2004 a strike by the Canadian Auto Workers union showed deep-rooted divisions between organized labour and the company's current management. The "CN North America" logo. This was used from 1993–95, before the company returned to the plain "CN" logo, which is still in use. The residents of Wabamun Lake, in Alberta, staged a blockade of CN tracks in August 2005, when they were unsatisfied with the railway's response to a derailment catastrophe that spilled over 700,000 Litres of tarry fuel oil and about 80,000 L of carcinogenic pole treatment oil into the lake. Reporters found pre-spill evidence. CN executives admitted CN failed to provide public safety information to prevent public exposure to carcinogenic, toxic chemicals. The tar-like oil and chemicals killed over 500 large migratory birds, animals, fish and other aquatic life. On August 5, 2005 in the Cheakamus River derailment, a CN train had nine cars derail on a bridge over the Cheakamus River, causing 41,000 litres (11,000 US gal) of caustic soda to spill into the river, killing thousands of fish by caustic burns and asphyxiation. The CBC reported environmental experts say it would take the river 50 years or more to recover from the toxic pollution. CN is facing accusations from local British Columbians over the railway's supposed lack of response to this issue, touted as the worst chemical spill in British Columbia's history. A further derailment at Moran, 20 miles (32 km) north of Lillooet, on June 30, 2006, has raised more questions about CN's safety policies. Two more derailments near Lytton in August 2006 have continued criticism. In the first case, 20 coal cars of a CPR train using a CN bridge derailed, dumping 12 cars of coal into the Thompson River. In the second case half a dozen grain cars spilled on a CN train. Two CN trains collided on August 4, 2007, on the banks of the Fraser River near Prince George, BC. Several cars carrying gasoline, diesel and lumber burst into flames. Water bombers were used to help put out the fires. Some fuel had seeped into the Fraser River. On December 4, 2007, a CN train derailed near Edmonton in Strathcona County, Alberta, at 3:30 a.m Mountain Standard Time. Of the 28 cars derailed, most of them were empty or carrying non-hazardous materials such as lumber or pipes. About 8:36 p.m., Central Daylight Time, on Friday, June 19, 2009, eastbound CN freight train U70691-18, traveling at 36 miles per hour (58 km/h), derailed at a highway/rail grade crossing in Cherry Valley, Illinois (near Rockford). The train consisted of 2 locomotives and 114 cars, 19 of which derailed. All of the derailed cars were tank cars carrying denatured fuel ethanol, a flammable liquid. Thirteen of the derailed tank cars were breached or lost product and caught fire. At the time of the derailment, several motor vehicles were stopped on either side of the grade crossing waiting for the train to pass. As a result of the fire that erupted after the derailment, a passenger in one of the stopped cars was fatally injured, two passengers in the same car received serious injuries, and five occupants of other cars waiting at the highway/rail crossing were injured. Two responding firefighters also sustained minor injuries. The release of ethanol and the resulting fire prompted a mandatory evacuation of about 600 residences within a 0.5-mile (0.80 km) radius of the accident site. Monetary damages were estimated to total $7.9 million. The probable cause of the accident was the washout of the track structure that was discovered about 1 hour before the train's arrival, and CN's failure to notify the train crew of the known washout in time to stop the train because of the inadequacy of CN's emergency communication procedures. Contributing to the accident was the CN's failure to work with Winnebago County to develop a comprehensive storm water management plan to address the previous washouts in 2006 and 2007. Contributing to the severity of the accident was the CN's failure to issue the flash flood warning to the train crew and the inadequate design of the DOT-111 tank cars, which made the cars subject to damage and catastrophic loss of hazardous materials in the derailment. In October 2013 the James Street bridge between Thunder Bay and Fort William First Nation was subject to an act of arson causing great structural damage to the bridge. The bridge was the most direct route between Thunder Bay and Fort William First Nation reserve and was used by foot traffic, vehicular traffic, and rail traffic. The matter of who is responsible for the maintenance and repair of the bridge is subject to great controversy between the City of Thunder Bay and CN due to an agreement dating back to 1906 between the Grand Trunk Pacific Railway Company (later incorporated as CNR along with other railways) and the City of Fort William (later merged with the City of Port Arthur into the City of Thunder Bay). The 1906 Agreement states that "The Company will give the Municipal Corporation the perpetual right to cross said bridge for ...vehicle and foot traffic" and that "The Company will maintain the bridge in perpetuity without cost to the Town..." After the fire, CN made repairs to the bridge for use of its rail system but did not repair the damage to the vehicle lanes which render it unsafe for vehicle use. CN maintains that the 1906 Agreement does not speak to replacement of the bridge while the position of the City of Thunder Bay is that CN is solely responsible for making the necessary repairs to restore function to the vehicle lanes of the bridge. In the years following CN's 1998 acquisition of Illinois Central, the company has come under scrutiny for illicit practices that allegedly cause the delay of Amtrak schedules. In 2012, Amtrak filed a formal complaint against CN with the Surface Transportation Board, stating that the prioritization of freight traffic over passenger traffic was commonplace on Amtrak routes operating on CN lines. The complaint cited over 4,000 delays during fiscal year 2011 on the route between Chicago and Carbondale, totaling over 26 days of net wasted schedule time; it also reported 99% of delays between Chicago and New Orleans on the City of New Orleans route were caused by CN dispatching issues. In 2018, Amtrak began issuing public report cards, grading the impact of freight railroads on passenger train performance. CN received the lowest-possible grade of "F" on the first card issued in March 2018. Robert Pace is the Chair of the CNR board. The other board members are Donald J. Carty, V. Maureen Kempston Darkes, Gordon D. Giffin, Edith E. Holiday, Luc Jobin, Denis Losier, Kevin G. Lynch, James E. O'Connor, Robert L. Phillips, and Laura Stein. Thornton and Harrison are the only non-Canadians to head CN. When CNR was first created, it inherited a large number of routes from its constituent railways, but eventually pieced its passenger network into one coherent network. For example, on December 3, 1920, CNR inaugurated the Continental Limited, which operated over four of its predecessors, as well as the Temiskaming and Northern Ontario Railway. The 1920s saw growth in passenger travel, and CNR inaugurated several new routes and introduced new services, such as radio, on its trains. However, the growth in passenger travel ended with the Great Depression, which lasted between 1929 and 1939, but picked up somewhat in World War II. By the end of World War II, many of CNR's passenger cars were old and worn down. Accidents at Dugald, Manitoba, in 1947 and Canoe River, British Columbia, in 1950, wherein extra passenger trains composed of older, wooden equipment collided with transcontinental passenger trains composed of newer, all-steel equipment, demonstrated the dangers inherent in the older cars. In 1953, CNR ordered 359 lightweight passenger cars, allowing them to re-equip their major routes. On April 24, 1955, the same day that the CPR introduced its transcontinental train The Canadian, CNR introduced its own new transcontinental passenger train, the Super Continental, which used new streamlined rolling stock. However, the Super Continental was never considered as glamorous as the Canadian. For example, it did not include dome cars. Dome cars would be added in the early 1960s with the purchase of six former Milwaukee Road "Super Domes". They were used on the Super Continental in the summer tourist season. Rail passenger traffic in Canada declined significantly between World War II and 1960 due to automobiles and airplanes. In the 1960s CN's privately owned rival CPR reduced its passenger services significantly. However, the government-owned CN continued much of its passenger services and marketed new schemes. One, introduced on 5 April 1962, was the "Red, White and Blue" fare structure, which offered deep discounts on off-peak days ("red") and were credited with increasing passenger numbers on some routes as much as 600%. Another exercise was the rebranding of the express trains in the Ontario–Quebec corridor with the Rapido label. In 1968, CN introduced a new high-speed train, the United Aircraft Turbo, which was powered by gas turbines instead of diesel engines. It made the trip between Toronto and Montreal in four hours, but was not entirely successful because it was somewhat uneconomical and not always reliable. The trainsets were retired in 1982 and later scrapped at Metrecy, in Laval, Quebec. On CN's narrow gauge lines in Newfoundland, CN also operated a main line passenger train that ran from St. John's to Port aux Basques called the Caribou. Nicknamed the Newfie Bullett, this train ran until June 1969. It was replaced by the CN Roadcruiser Buses. The CN Roadcruiser service was started in fall 1968 and was run in direct competition with the company's own passenger train. Travellers saw that the buses could travel between St. John's and Port aux Basques in 14 hours versus the train's 22 hours. After the demise of the Caribou, the only passenger train service run by CN on the island were the mixed (freight and passenger) trains that ran on the Bonavista, Carbonear and Argentia branch lines. The only passenger service surviving on the main line was between Bishop's Falls and Corner Brook. In 1976, CN created an entity called Via-CN as a separate operating unit for its passenger services. Via evolved into a coordinated marketing effort with CP Rail for rail passenger services, and later into a separate Crown corporation responsible for inter-city passenger services in Canada. Via Rail took over CN's passenger services on April 1, 1978. CN continued to fund its commuter rail services in Montreal until 1982, when the Montreal Urban Community Transit Commission (MUCTC) assumed financial responsibility for them; operation was contracted out to CN, which eventually spun off a separate subsidiary, Montrain, for this purpose. When the Montreal–Deux-Montagnes line was completely rebuilt in 1994–1995, the new rolling stock came under the ownership of the MUCTC, until a separate government agency, the Agence métropolitaine de transport (now AMT), was set up to consolidate all suburban transit administration around Montreal. Since then, suburban service has resumed to Saint-Hilaire, and a new line to Mascouche opened in December 2014. In Newfoundland, Terra Transport would continue to operate the mixed trains on the branch lines until 1984. The main line run between Corner Brook and Bishop's Falls made its last run on September 30, 1988. Terra Transport/CN would run the Roadcruiser bus service until March 29, 1996, whereupon the bus service was sold off to DRL Coachlines of Triton, Newfoundland. CN operates the Agawa Canyon Tour excursion. From the acquisition of the Algoma Central Railway in 2001 until service cancellation in July 2015, CN operated passenger service between Sault Ste. Marie and Hearst, Ontario. The passenger service operated three days per week and provided year-round access to remote tourist camps and resorts. In January 2014, CN announced it was cutting the service, blaming the Canadian federal government for cutting a subsidy necessary to keep the service running. It was argued as an essential service; however, the service had always been deemed financially uneconomic, and despite an extension of funding in April 2014, Algoma Central service was suspended as of July 2015. CN operates the Agawa Canyon Tour excursion, an excursion that runs from Sault Ste. Marie, Ontario, north to the Agawa Canyon. The canyon tour train consists of up to 28 passenger cars and 2 dining cars, the majority of which were built for CN by Canadian Car and Foundry in 1953–54. These cars were transferred to the D&RGW Ski Train and bought back by CN in 2009. After CN acquired BC Rail in 2004, it started operating a railbus service between Seton Portage and Lillooet, British Columbia called the Kaoham Shuttle. CN crews used to operate commuter trains on behalf of GO Transit in the Toronto and the surrounding vicinity. This changed in 2008 when a deal was reached with Bombardier Transportation that switched all CN crews for Bombardier crews. CN 6167 at Guelph, Ontario. The CNR acquired its first 4-8-4 Confederation locomotives in 1927. Over the next 20 years, it ordered over 200 for passenger and heavy freight service. The CNR also used several 4-8-2 Mountain locomotives, almost exclusively for passenger service. No. 6060, a streamlined 4-8-2, was the last CN steam locomotive, running in excursion service in the 1970s. CNR also used several 2-8-2 Mikado locomotives. CN inherited from the Canadian Northern Railway several boxcab electrics used through the Mount Royal Tunnel. Those were built between 1914 and 1918 by General Electric in Schenectady, New York. To operate the new Montreal Central Station, which opened in 1943 and was to be kept free of locomotive smoke, they were supplemented by nearly identical locomotives from the National Harbours Board; those engines were built in 1924 by Beyer-Garratt and English-Electric. In 1950, three General Electric centre-cab electric locomotives were added to the fleet. In 1952 CN added electric multiple units built by Canadian Car and Foundry. Electrification was restricted to Montreal, and went from Central Station to Saint-Lambert (south), Turcot (west), Montréal-Nord (east) and Saint-Eustache-sur-le-lac, later renamed Deux-Montagnes, (north). But as steam locomotives gave way to diesels, engine changeovers were no longer necessary, and catenary was eventually pulled from the west, east and from the south. However, until the end of the original electrification, CN's electric locomotives pulled Via Rail's trains, including its diesel electric locomotives, to and from Central Station. The last 2,400 V DC CN electric locomotive ran on June 6, 1995, the very same locomotive that pulled the inaugural train through the Mount Royal Tunnel back in 1918. Later in 1995 the AMT's Electric Multiple Units began operating under 25 kV AC 60 Hz electrification, and in 2014, dual-power locomotives entered service on the Mascouche line. In May 1966 Canadian National Railways ordered five seven-car UAC TurboTrain for the Montreal–Toronto service. It planned to operate them in tandem, connecting two trains together into a larger fourteen-car arrangement with a total capacity of 644 passengers. The Canadian trains were built by Montreal Locomotive Works, with their ST6 engines supplied by UAC's Canadian division (now Pratt&Whitney Canada) in Longueuil, Quebec. CN and their ad agency wanted to promote the new service as an entirely new form of transit, so they dropped the "train" from the name. In CN's marketing literature the train was referred to simply as the "Turbo", although it retained the full TurboTrain name in CN's own documentation and communication with UAC. A goal of CN's marketing campaign was to get the train into service for Expo '67, and the Turbo was rushed through its trials. It was late for Expo, a disappointment to all involved, but the hectic pace did not let up and it was cleared for service after only one year of testing. 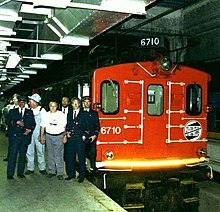 The Turbo's first demonstration run in December 1968 with Conductor James Abbey of Toronto in command, included a large press contingent. An hour into its debut run, the Turbo collided with a truck at a highway crossing near Kingston. The Turbo's final run was on October 31, 1982. CNR's first foray into diesel motive power was with self-propelled railcars. In November 1925, Railcar No. 15820 completed a 72-hour journey from Montreal to Vancouver with the 185-horsepower (138 kW) diesel engine in nearly continuous operation for the entire 4,726 kilometres (2,937 mi) trip. Railcars were used on marginal economic routes instead of the more expensive to operate steam locomotives used for busier routes. In 1929, the CNR made its first experiment with mainline diesel electric locomotives, acquiring two 1,330-horsepower (990 kW) engines from Westinghouse, numbered 9000 and 9001. It was the first North American railway to use diesels in mainline service. These early units proved the feasibility of the diesel concept, but were not always reliable. No. 9000 served until 1939, and No. 9001 until 1947. The difficulties of the Great Depression precluded much further progress towards diesel locomotives. The CNR began its conversion to diesel locomotives after World War II, and had fully dieselized by 1960. Most of the CNR's first-generation diesel locomotives were made by General Motors Diesel (GMD) and Montreal Locomotive Works. For its narrow-gauge lines in Newfoundland CN acquired from GMD the 900 series, Models NF110 (road numbers 900–908) and NF210 (road numbers 909–946). For use on the branch lines, CN purchased the EMD G8 (road numbers 800–805). For passenger service the CNR acquired GMD FP9 diesels, as well as CLC CPA16-5, ALCO MLW FPA-2 and FPA-4 diesels. These locomotives made up most of the CNR's passenger fleet, although CN also owned some 60 RailLiners (Budd Rail Diesel Cars), some dual-purpose diesel freight locomotives (freight locomotives equipped with passenger train apparatus, such as steam generators) as well as the locomotives for the Turbo trainsets. Via acquired most of CN's passenger fleet when it took over CN passenger service in 1978. The CN fleet as of 2007[update] consists of 1548 locomotives, most of which are products of either General Motors' Electro-Motive Division (EMD), or General Electric/GE Transportation Systems. Some locomotives more than 30 years old remain in service. Much of the current roster is made up of EMD SD70I and EMD SD75I locomotives and GE C44-9W locomotives. Recently acquired are the new EMD SD70M-2 and GE ES44DC. Since 2015 the GE ES44AC & GE ET44AC are the latest units. Beginning in the early summer months of 2010, CN purchased a small order of GE C40-8's and GE C40-8W's from Union Pacific and BNSF Railway, respectively. The intent was to use them as a cheaper power alternative. CN currently have 65 GE ES44ACs on its roster and all 65 were ordered and delivered from December 2012 – December 2013. They are CN's first AC-powered locomotives. In 2015, CN started ordering more GE units, the ET44AC. CN locomotives have long featured unique features, unlike the stock EMD and GE locomotives. CN introduced a wide-nosed four window Comfort Cab, the predecessor to the now standard North American Safety Cab, which is now standard on new North American freight locomotives. After a BC derailment, CN introduced ditch lights, lights mounted on or just below the anti-climbers on the front pilot of a locomotive. These are used to make trains more visible at grade-crossings, and to give better visibility around curves. Since then, ditch lights have become standard features on all North American locomotives. CN continued to use class lights on its locomotives for many years, up to as recently as the C40-8M and SD60F (which feature red, green and white class lights), and the first order C44-9WL locomotives which retained white class lights. More recently, CN has had red marker lights installed on their ES44DC and SD70M-2 locomotives, for use when the locomotives are in DPU service. The latest orders of the GE's all have the red marker lights on both ends of the locomotive. CN's first few orders of ES44DC's, like their C44-9W's, feature "tear-drop" windshields, windshields with the outer lower corner dropped (like earlier SD70Is) as opposed to the standard rectangular GE windshield, for better range of vision. CN's latest GE units now have the standard rectangular windshields. The first order of SD70M-2 locomotives (8000 series) had their headlights mounted on the cab, while the second order (8800 & 8900 series) dropped the headlight to the nose, and also features added red marker lights mounted above the windshields on the cab. While many railroads have ordered new "desktop" controls, where the controls are arranged on a desk—CN returned earlier than most to the conventional control stand that most locomotive engineers prefer, which features a stand to the side of the engineer with controls that stick out horizontally. This arrangement makes reverse operation easier, and allows engineers to "put their feet up," without feeling stuck at a desk all day. CN's General Motors retired SD50F, retired SD60F, retired Bombardier HR-616's, and General Electric C40-8M feature a full-width car body that is tapered directly behind the cab, to allow for better rear visibility. This is referred to as a "Draper taper" after its creator. The first order of the GE C44-9WL (2500–2522) was also initially an order for 18 locomotives with the full-width Draper taper car body. They were changed to a standard long hood with a CN-style four-window cab and the order was increased to 23 locomotives at the same price. CN operates a rail barge service between Prince Rupert, British Columbia to Whittier, Alaska since 1963. The barge has 8 tracks that can hold about 50 railcars. The barge is towed by tugs contracted to Foss Maritime. CN owns a large number of large yards and repair shops across their system, which are used for many operations ranging from intermodal terminals to classification yards. Below are some examples of these. Toronto Terminal Railways – management team for Toronto's Union Station with Canadian Pacific Railway. ^ "Stock Analysis: Canadian National Railway Company (NYSE:CNI) A Value Buy, But Not a Dividend Buy | Dividends Value". Google. November 17, 2008. Retrieved March 2, 2011. ^ "Facts and Figures". CN. Archived from the original on January 28, 2016. Retrieved January 21, 2016. ^ "CNI : Summary for Canadian National Railway Compa - Yahoo Finance". ca.finance.yahoo.com. Retrieved September 23, 2018. ^ "Bill Gates now biggest CN shareholder (CA;CNR)". CBC News. April 25, 2011. Retrieved April 26, 2011. ^ "Telegraph". The Canadian Encyclopedia. Historica-Dominica. Retrieved June 18, 2013. ^ a b c Lloyd's Register, Steamers & Motorships (PDF). London: Lloyd's Register. 1932. Retrieved January 3, 2014. ^ a b c d e Swiggum, Sue; Kohli, Marj (February 28, 2010). "Canadian National Steamship Company". The Ships List. Retrieved January 3, 2014. ^ a b ""Lady" Liners Sail to West Indies". The Evening Post. CXXV (72). Wellington: National Library of New Zealand. March 26, 1938. p. 27. Retrieved January 3, 2014. ^ Lloyd's Register, Steamers & Motorships (PDF). London: Lloyd's Register. 1931. Retrieved January 3, 2014. ^ Hannington, Felicity (1980). The Lady Boats: The Life and Times of Canada's West Indies Merchant Fleet. Halifax, NS: Canadian Marine Transportation Centre, Dalhousie University. ISBN 0770301894. ^ "CN Commercialization Act (S.C. 1995, c. 24)". GoC Justice Laws Website. Government of Canada. Retrieved November 7, 2015. ^ "Railway Gazette: Railway could tap Quebec's northern wealth". Railway Gazette International. Retrieved April 23, 2012. ^ "CN tests natural gas/diesel fuel powered locomotives between Edmonton and Fort McMurray, Alta". Retrieved September 29, 2012. ^ "Building bridges in just a fraction of time". Detroit News. Retrieved April 7, 2017. ^ "Transportation Safety Board of Canada | Rail". Tsb.gc.ca. July 31, 2008. Archived from the original on March 7, 2012. Retrieved May 15, 2012. ^ "Country of Origin | Brand Identity". brandchannel.com. Archived from the original on August 19, 2012. Retrieved May 15, 2012. ^ "Spill recovery could take decades". Canadian Broadcasting Corporation. February 7, 2006. Retrieved January 15, 2007. ^ "CN Prince George fire under control". CBC News. August 4, 2007. Retrieved October 12, 2009. ^ "CN Derailment – UPDATED". 630 CHED. December 4, 2007. Archived from the original on December 29, 2007. Retrieved December 5, 2007. ^ "Bridge blaze". TBNewsWatch. October 29, 2013. Retrieved July 17, 2014. ^ "1906 Agreement". Retrieved July 17, 2014. ^ "James Street bridge remains closed". NetnewsLedger.com. February 22, 2014. Retrieved July 17, 2014. ^ "CN Rail Sets Deadline to Thunder Bay on Bridge". NetNewsLedger.com. July 16, 2014. Retrieved July 17, 2014. ^ "Amtrak files long-overdue complaint over CN delays". Chicago Tribune. Retrieved December 4, 2015. ^ Kingston, John (March 26, 2018). "Amtrak's initial report card on freight railroads ranges from A to a pair of F's". FreightWaves. Retrieved July 30, 2018. ^ "The Board and Its Committees." Archived July 5, 2016, at the Wayback Machine Canadian National Railway Company. Retrieved 21 August 2016. ^ "Historical Heads of CN". CN.ca. Canadian National Railway Company. Retrieved August 16, 2016. ^ "CN Board appoints Jean-Jacques Ruest President and CEO". Retrieved July 28, 2018. ^ "CN to cut passenger service to Hearst". Northern Ontario Business. Retrieved January 28, 2014. ^ "GO deal swaps CN crews with Bombardier personnel". Toronto Star. November 9, 2007. Retrieved September 13, 2011. ^ a b c Holland, Kevin J (December 2017). "Trains of Fame". Canada's History. 97 (6): 20–29. ISSN 1920-9894. ^ "CN to acquire 161 locomotives to handle expected traffic increases, improve operational efficiency | cn.ca". www.cn.ca. Retrieved April 7, 2017. ^ "Ditch Lights". American-Rails.com. Retrieved April 7, 2017. ^ Trains Magazine (July 8, 2006). "North America's Hump Yards". Retrieved June 27, 2008. Bruce, Harry (1997). The pig that flew: The battle to privatize Canadian National. Vancouver: Douglas & McIntyre. ISBN 1-55054-609-0. Cameron, Douglas (1992). The people's railway: A history of Canadian National. Vancouver: Douglas & McIntyre. ISBN 1-55054-062-9. Brown, Ron (2008). The Train Doesn't Stop Here Anymore. Dundurn Group. ISBN 978-1-55002-794-5. Wikimedia Commons has media related to Canadian National Railway.